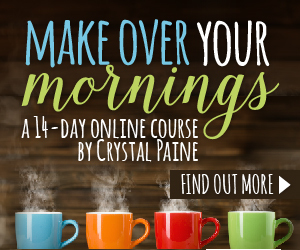 Have you seen the 14-day course Make Over Your Year from Crystal Paine of MoneySavingMom.com floating around online? It’s a simple, effective 4-week, hands-on course designed to help you take your big dreams and ideas and turn them into realistic goals and a doable action plan. Maybe you’ve wondered if this is another gimmick or if it could be useful for you. Maybe it grabbed your attention as something that you know can help you be productive at setting and completing goals but you’re on the fence on the cost and time commitment. Having gone through the course myself I wanted to share my experience with you. I bought the course on its original launch day. I am one of those Type A girls who loves to have a plan in place, a to-do list in hand and setting goals is one of my favorite things to do. I find that goals keep me on task throughout the year. They help me see the bigger picture and put a plan in place for the year. I love the feeling of completing a goal! I love knowing I am in charge of the direction that my life is taking and not letting life just happen to me. We have a purpose and need to live as if we do. Make Over Your Year has helped me set goals for my personal life, my marriage, my blog, my parenting and even my walk with God. At the beginning of each New Year I go back and do the course again as a refresher as I think about what my priorities and dreams are for the coming year and I make some goals based on them. Without this course, I may not be as intentional with my time as I could be. I want to leave a legacy behind and that doesn’t happen without some planning. 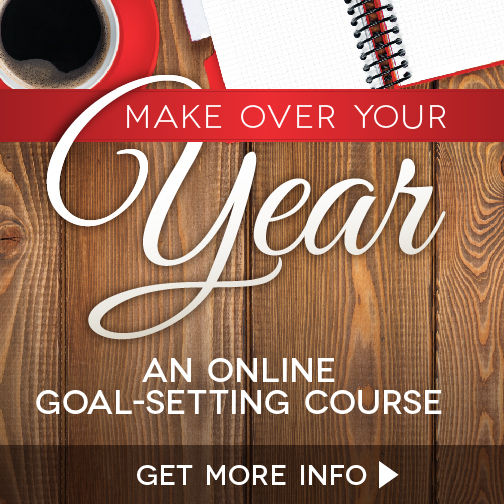 Make Over Your Year is a 14-day course that will help you set realistic goals and an action plan to reach them. I love that not only do you set the goals but you will also learn how to break them down into manageable bite-sized pieces to make them a reality. The course includes a handbook, weekly videos, worksheets, and projects. The videos are done by both Crystal and her husband Jesse. I love that this was a joint effort! Crystal shamelessly says that she learned how to make goals from her husband. I don’t think that this course is for everyone. If you aren’t willing to watch the videos, read the short chapters and complete the projects for the week then this course isn’t going to be a good fit for you. Save your money for something else. This course is for you if you would put in the work. It’s for you if you are a purpose driven person. If you have a goal and need the tools to get it done. It’s for you if you feel like you could be more productive and intentional with your time if only someone would walk you through the steps on how they are productive and intentional with their time. This course is for you if you have a big dream that you wish you could achieve. This course is for you if you so many different priorities and tasks on your plate but you don’t know how to prioritize your time to meet all of the needs. This course is for you if you are tired of wasting your precious time on things that don’t matter. While this course isn’t for everyone it is for most people. It’s for women, mothers, work at home or outside the home moms, men, college students and even high school students can benefit from Make Over Your Year. Not at all. The videos, workbook and a project will take you 20-30 minutes each week for only 4 weeks. It’s super quick. You could even multitask while watching the videos. You’ll spend the most time on the projects as they take more self-reflection, evaluation and goal writing. Busy people can carve out 20 minutes a week for this course. It’s important that we take time out for ourselves if we are going to pour into our family. Taking a course that betters yourself is one of those things that you can do during that time. It will work if you stick to your plan. It will work if you are intentional about following your action plan, taking time to evaluate where you stand throughout the year. It will work if you keep your goals where you can see them, not tucked away in a folder where you won’t see them again for the rest of the year. If you don’t, then no it won’t work for you. Crystal gives you the tools that you need, she walks you through the process but it’s up to you to put in the work for the rest of the year. Make your action plan and get it done! Then it will work for you and you will keep coming back to it each New Year. As a wife, homeschool mother, and blogger I highly suggest this course for everyone. It can help you if you are willing to do some work. It’s for everyone, even us busy women with a lot on our plates. If you are feeling like life is overwhelming and exhausting but, as hard as you try, you just can’t ever seem to make much progress in the right direction? Are you ready to make a change? If you are, then join me in taking Crystal Paine’s brand-new 4-week Make Over Your Year course. Are you ready to start the course? Do you have any other questions that I can answer for you?